Faced with necessary reforms, Beijing must make bold choices—just like during the Qing Dynasty. It is true that China is no longer beset by threats of foreign incursion nor is it a laggard in the world of economic development and trade. But being there and being steeped in an atmosphere of seemingly endless political and economic tension where questions of how far the leadership is willing (able?) to go in making reforms does make one think back to the end of the Qing, China's last dynasty, during its waning years at the end of the 19th century. While the analogy is not perfect, one is left to ponder whether Party General Secretary Xi Jinping might end up being the Empress Dowager Cixi of the Communist era, a victim of the same wager: Fail to reform rapidly enough and risk stasis. Reform too rapidly and risk instability and even upheaval. It’s interesting to reflect on Cixi's ambivalence toward reform, not to say her indignation at the way foreigners hectored and bullied China and then to compare that to the reluctance (so far) of China's current leaders to take risks and push toward a bold reform agenda. It's also interesting to recall that by the time Cixi actually embraced constitutional monarchy after the Boxer rebellion in 1900, China's traditional system of leadership was already so enfeebled that it was too late to reformat it. Indeed, in dynastic history the question of when major reforms happen is a critical one in any "mid-dynastic revival"—zhōngxìng—or in what Xi Jinping now calls "rejuvenation"—fùxīng. We now speak of "the end of the Qing," Qīng mò, when speaking of the waning years of the last imperial dynasty. If reforms again fail, might we some day find ourselves speaking of this interim as "the end of the People's Republic," Rénmín Gònghéguó mò? By the turn of the last century, the Qing Dynasty was like a once great and fierce prize bull that was gushing blood from every limb, having been lanced, stabbed and barbed since the 1830s—when the trouble really became obvious—and was, by the early 1900s, just waiting for the matador to do him in once and for all. 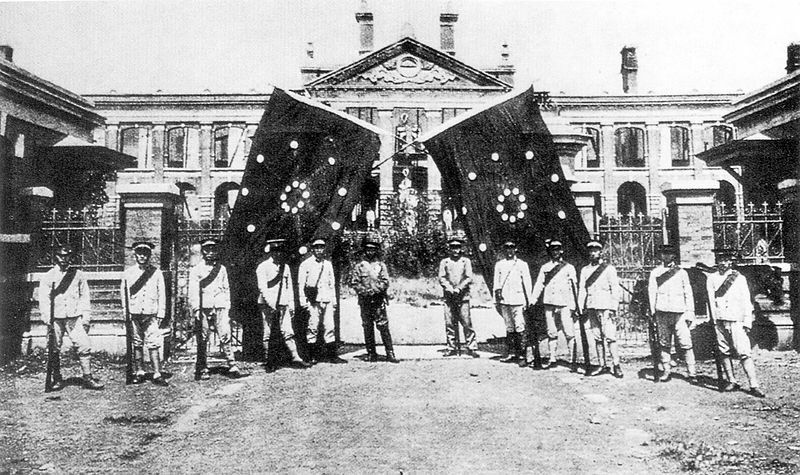 The scale and intensity of the Qing’s afflictions in the 19th century are staggering to think back upon: civil disorders such as the Boxers coming after full-scale civil war during the mid-century Taiping rebellion; defeat at sea and on land to the British, French, Japanese, and finally, in 1900, to an eight-nation allied force, resulting in treaties that obliged the Qing to cede territory and pay hundreds of millions in indemnities to its vanquishers; all this, while the economy stagnated, the environment deteriorated, and bureaucracy resisted reform and was riddled with corruption. Many topics on such a list will ring bells of familiarity with observers of contemporary China, and the renewed interest in the late Qing is of a more than antiquarian nature. But still, the depth of the problems faced by the Qing 100 years ago would seem to outstrip even the more dire diagnoses of today, and the Communist Party under Xi Jinping would appear to have much more formidable resources at its disposal than those the Qing state with Empress Dowager Cixi at the helm could muster. To offer just one example—succession of a paramount ruler was a crippling problem for the Qing from 1860 onwards. The series of weak boy emperors left a vacuum at the top that Cixi could not fill. But the CCP has been moving toward increasingly orderly successions of power, as demonstrated by the relatively smooth ascents of Hu Jintao and Xi Jinping, and the strong consensus with the Party now around Xi. Orville is right that the CCP would be wise to study not only the fate of the Soviet Union, which, from a PRC perspective, reformed too fast under Gorbachev, but also the fate of the Qing, which reformed too slow. But they also can take some solace in the likelihood that at this stage at least, given China’s decades of economic dynamism and growing international stature, they are much better placed to take “reform and opening-up” to the next level than were their Qing forebears a century ago. In recent years, many events in China—and elsewhere—have brought to mind, sometimes in unexpected ways, Chinese events of a century or so ago. For example, even though when Mubarak first fell at the start of the Arab Spring, the obvious China-Egypt analogy seemed to only involve the recent past (Tahrir Square protests seeming similar in some ways to the Tiananmen Square ones of 1989), recent moves by Cairo’s generals have been reminiscent of Chinese events of the start rather than end of the twentieth century. What has been happening in Egypt lately parallels Qing military-official-turned-revolution-backer Yuan Shikai's moves in 1912 to put an end to Sun Yatsen’s very short term as China’s first President. There are many Qing era echoes in current Chinese political discourse, especially in criticism of current leaders acting, in effect, like part of an extended and corrupt ruling family whose members live privileged lives far removed from those of ordinary people. One contrast, though, has to do with the notion of the fate China needs to avoid. Late in the Qing, the scenario that caused the most anxiety involved China becoming a wangguo (a “lost country,” a term that inspired visions of a government losing sovereignty or a people being enslaved). Reformers and Qing cliques alike called for action to prevent this, while arguing over how exactly China could be protected from suffering the fate of India, say, yet retain the imperial system. Revolutionaries, meanwhile, began to refer—as Taiping insurgents had before them—to the country already being in the hands of foreigners, the Manchus, and of Han Chinese needing cast off the shackles of enslavement. Today’s government makes plenty of use of notions of real and imaginary foreign pressure, of course, stressing China’s need to defend its sovereignty in dangerous times. And yet, a different fate to be avoided is often invoked: the recurrence of the self-inflicted traumas and turmoil of the Cultural Revolution. Defenders of Party rule point fingers at individuals or groups, saying that a particular faction’s rise or the unraveling of the status quo would lead to spiraling in that dreaded direction. Others counter that the Cultural Revolution was a result of Communist Party rule, so fear of a repeat will only disappear when it loses its monopoly on power. China in 2013 on the face of it shows little resemblance to the dying empire of 1900-1910. Xi Jinping is no Empress dowager; the economy is still growing, and foreign powers have no desire to alter China’s domestic regime. And yet ... the suppression of dissent, the instigation of patriotic defensiveness, the rampant corruption, and the inadequate response of the ruling elite to rapidly changing global conditions calls to mind some curious parallels. The five million Manchus attacked by Chinese nationalists in the 1900s were less than 2 percent of the total population; the Communist Party now has 80 million members, still less than 6 percent of the total population. Both elites lost confidence in their ideological supremacy. The Manchus lost their ethic of military austerity as they adopted Han Chinese norms of civil culture, decadent leisure, and commercial profit. At the same time they set themselves off from the majority of the country by clinging to their outworn privileges, making them targets for radical Han nationalists. Just as late Qing Manchus had no serious military skills, and based their legitimacy to rule purely on descent from conquering families, Communist Party members today have no serious commitment to socialism or the austere virtues of Yan’an. They induct new members for material and political benefit, and do their best to protect inherited privileges. Clearly, for both groups, family values are alive and well, although today the elites invest in Harvard educations instead of grandiose palaces for their children. Yet despite its weakness, the last decade of the Qing was one of the most culturally creative decades of the entire dynasty. Besides the exiled revolutionaries and the nationalist agitators, critical writers found refuge in the treaty ports—protected spaces analogous to modern Internet sites—where visionary ideas flourished. Novels and mass publications inspired by Jules Verne imagined Utopian societies everywhere, even on the moon. Students flocked to foreign countries, seeking new knowledge from the West and Japan to make China stronger. Where are the equivalent creative voices today? But resentment, envy, and aspirations for Western modernity fueled mass movements that threatened the state, if not quickly coopted or suppressed. Instead of attacking foreigners and “Chinese traitors” (Hàn jiān) with spears and hoes, the new Boxers, (the iHetuan?) write venomous blogs and organize rabidly nationalist email campaigns. The government, torn between the need for radical change and defense of its elite privileges, suppresses movements for constitutionalism while claiming it supports reform—too little too late. Foreigners, instead of sending military expeditions to invade Beijing, launch their venture capitalists and manufacturing ventures across China, employing Chinese workers and enriching local officials from profits from export trade. Ultimately, the rising wealth of Chinese middle classes fueled by global trade may prove more subversive than any mass uprising or military expeditions. The P.R.C., unlike the Qing, has the military power to suppress open challenges, but like gas seeping out of a balloon, the Party flails at suspected enemies with no coherent strategy. The Qing ended with a bang; but some regimes end with a whimper. In its last years, the Qing dynasty embarked on an ambitious set of New Policy (Xīn Zhèng) reforms to revive its sclerotic system of rule. But the new schools which replaced the Confucian examination system became breeding grounds for revolutionary ideas; and the New Army attracted patriotic youths more interested in saving their country than protecting the emperor. Constitutional reforms empowered a disaffected elite. In the end, the reforms designed to save the dynasty led to the 1911 Revolution that ended it. The current Chinese leadership is painfully aware of the complex relationship between reform and revolution. Politburo member Wang Qishan has urged his colleagues to read Alexis de Tocqueville’s The Old Regime and the Revolution—a classic work arguing that the French Revolution emerged not from the oppression of the people but from the reforms of Louis XV. The P.R.C. leadership’s preoccupation with maintaining stability (wéiwěn) certainly reflects the sense of insecurity that comes with the reform process. Of all the similarities between the present and the late Qing, the one that seems most compelling to me is the role of new media. In the late Qing, it was the telegraph and newspapers. The two combined to bring news of current affairs to an eager reading public, and from this a vigorous public opinion emerged to propel reform. Today it is the Internet and blogs that challenge the state’s command of public discourse. On the other hand, it is difficult for me to see the current regime subject to threats similar to the Qing in its final years. Most fundamentally, the army today is fully controlled by the Chinese Communist Party. Its loyalty is beyond question, and its willingness to use force to maintain the current regime is clear. The most fundamental difference I see between the late Qing and the present is the culture of confidence in China today. In the last years of the Qing, Chinese generally believed that, in order to survive, China needed to abandon many of its traditional institutions and learn from the West and Japan. Now, especially after the Euro-American financial collapse of 2008 (also the year of China’s triumphal Olympics), China’s leaders are confident that its political and economic system is superior to that of the West. In many ways, these leaders remind me less of Cixi than of Qianlong in the 18th century, who disdained any need to learn of the West’s new technology. Like Qianlong, the current leaders have experienced years of unbroken progress. What will happen if they are challenged by setbacks in the economy, the environment, or the always troubled ethnic frontier? Orville’s musings on Xi and Cixi are stimulating and intriguing. But the parallel simply doesn’t extend far enough. Cixi presided (I intentionally misuse the word—nothing about Cixi was “presidential”) over a moment of supreme civilizational cataclysm. It was, as Orville and John Delury’s fine new book Wealth and Power reminds us, a long moment, already underway decades before Cixi’s final spasm of reform mandates, but it was really civilizational in dimension. Xi Jinping, by contrast, has architectural reforms to present, if predictions of this fall’s Central Committee Plenum are correct. Mostly they are likely to be in the realm of economic policy, intertwined with social programs designed to alleviate some of the terrible stresses confronting China after four decades of reform and opening. But they are essentially different in kind—and Xi’s position is different in kind—from what China and Cixi faced eleven decades ago. The problem of the Center’s control over the localities. In this vertically organized political system, even though the whole late Qing imperial bureaucracy only numbered about 40,000 and today's Communist Party numbers 80 million, the problem of establishing and maintaining the probity of the bureaucracy that runs China, persists. Leninist parties like the C.C.P. have their own rules, and their own enforcement mechanisms—but like its imperial predecessors, the C.C.P., as today's high-visibility corruption cases attest, still has only itself on which to rely in dealing with its own behavioral problems, high and low. So did the Qing. The persistence of reactionary conservatism. The power of anti-reform thinking and writing in the late Qing can hardly be overstated, though Orville’s book hints at it on several occasions. Today, the virulence of contemporary reactionary conservatism is widely visible, even if its full extent remains hidden. Xi Jinping’s handling of this tremendous anti-reform power, which is interlarded with the “vested interests” that are so widely referred to in China, will largely define his regime, and China’s course in the short to mid-term. Signals so far suggest that at a minimum he is bent on adhering to such rigid perspectives in the realm of “stability maintenance,” but we will have to see whether the economic and social policy changes he might espouse this November actually have, built in, capacities for less reactionary evolutionary changes in Chinese society. Ideological incompleteness. Cixi’s setting-sun reforms, above all the severing of the link between the vast corpus of Imperial Confucian writings and the exam-based recruitment of imperial government officials after a thirteen-hundred year run, took place as a tidal wave of ideological confusion engulfed China. But the notion that Chinese society must rest on a body of shared normative concepts—a social-ideological consensus—did not die. The C.C.P. after 1949 set about re-establishing that consensus around a body of Marxist-Leninist precepts and practices, and it has dominated the cultural and educational apparatus of the state ever since in an effort to set that consensus in stone. It very much remains to be seen, however, whether that circle has been fully closed. Ideological incompleteness, for lack of a better term, remains a challenge to this and future P.R.C. administrations. So far, the emphasis appears to be on fire-fighting when someone gets too creative and pervasive fire prevention, from the Great Firewall of China to the unending attempts to guide popular thinking. None of this has been particularly successful, however. It may turn out that Mr. Xi and his successors place their bets on policies conducive to social and economic development, in the belief that from such social success normative consensus will emerge. In any event, the nagging problem of ideological incompleteness—sometimes front and center, and at other times a sort of background noise—links the China of Cixi’s time to the China of Mr. Xi.